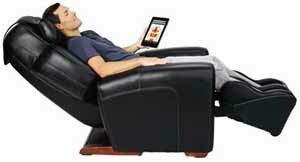 Robotic Massage Chair - Compare and review all the best Robotic Human Touch Massage Chairs. Human Touch Luxury Massage Chairs. By analyzing the treatments used by leading massage therapists, chiropractors and physicians, and applying decades of experience as the world leader in massage technology, Human Touch engineers have developed the most advanced Robotic Massage systems ever devised. Every Human Touch massage chair expertly replicates the hands and techniques of expert massage professionals. The Human Touch robotic massage chair simulates the hands of a real-life massager better than any other chair and uses the same therapeutic techniques as spinal care professionals, which is why Human Touch Technology is the preferred technology of the American College of Chiropractic Orthopedists. A HT massage chair replicates the four techniques used by massage professionals: rolling, kneading, compression, and percussion. It also delivers a full body massage from head to toe. And, there are multiple automatic programs that allow you to choose the parts of the body to be massaged, the strength of the massage, and the massage techniques employed: you get a personal, customized massage of your own design. HT-095 massage chair includes Human Touch Technology�, Quad-Roller is designed to follow the curve of your spine and offers an enhanced massage in the cervical and lumbar regions, 4 Massage Functions including Rolling, Kneading, Compression, and Percussion in multiple speeds. The HT100 chair retails for around $1,500 and comes with 1 speed rolling, kneading, compression, and percussion programs. The range control is either Spot (stationary massage in kneading or compression function) or Partial (partial massage stroke 3” up & down for kneading or compression). You get power recline and the massage discs can be moved to accommodate your exact shape (they are manually adjusted). There are 3 programmed massage sessions of 15 minute duration. The calf and foot massager has 2 speed settings and can be manually retracted/deployed. The vertical length of the rolling discs is 20 inches. The recline angle is 170 degrees. Offers the same functionality as the HT-100 massage chair with the only real difference being the overall styling of the chairs. The HT102 massage chair comes in Leather Match Vinyl in either Bone or Black, with the HT103 massage chair coming in either Cashew or Black. The HT125 massage chair offers Full-Body Stretching. The calf massage wells will gently hold your legs as the chair reclines to arch your back and engage a gentle body stretching program with an active massage of your lower back. Luxurious Leather with Memory foam Seat cushions. You get more massage functions; 1 speed rolling, 2 speed kneading, 2 speed kneading and percussion, 2 speed compression and 2 speed percussion. It comes with quite a few good features such as a visco elastic foam seat cushion (memory foam that molds to your exact shape), auto-restore (back upright/footrest down) and a multi-function thumb joystick backrest and footrest control. The HT135 massage chair offers Full-Body Stretching. The calf massage wells will gently hold your legs as the chair reclines to arch your back and engage a gentle body stretching program with an active massage of your lower back. Luxurious Leather with Memory foam Seat cushions. You get more massage functions; 1 speed rolling, 2 speed kneading, 2 speed kneading and percussion, 2 speed compression and 2 speed percussion. It comes with quite a few good features such as a visco elastic foam seat cushion (memory foam that molds to your exact shape), auto-restore (back upright/footrest down) and a multi-function thumb joystick backrest and footrest control. The HT136 massage chair offers Full-Body Stretching. The calf massage wells will gently hold your legs as the chair reclines to arch your back and engage a gentle body stretching program with an active massage of your lower back. Luxurious Leather with Memory foam Seat cushions. You get more massage functions; 1 speed rolling, 2 speed kneading, 2 speed kneading and percussion, 2 speed compression and 2 speed percussion. It comes with quite a few good features such as a visco elastic foam seat cushion (memory foam that molds to your exact shape), auto-restore (back upright/footrest down) and a multi-function thumb joystick backrest and footrest control. Full-Body Stretching The calf massage wells will gently hold your legs as the chair reclines to arch your back and engage a gentle body stretching program with an active massage of your lower back. Luxurious Leather with Memory foam Seat cushions. NEW Extending footrest for taller individuals. NEW Articulating docking station for the hand held controller. Full-Body Stretching The calf massage wells will gently hold your legs as the chair reclines to arch your back and engage a gentle body stretching program with an active massage of your lower back. 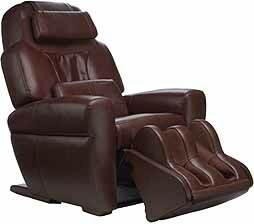 Luxurious Leather with Memory foam Seat cushions. The HT275 chair includes Lumbar Heat and an adjustable width calf/foot massager. Easy Care Leather Match Vinyl. Full-Body Stretching The calf massage wells will gently hold your legs as the chair reclines to arch your back and engage a gentle body stretching program with an active massage of your lower back. 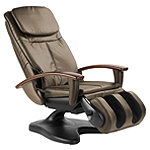 The HT1650 chair really takes robotic massage to its highest level. The calf and foot massager can be fully retracted so as to be hidden away completely. Your get an onboard convenience outlet, visco elastic cushion, arm rest vibration and an exclusive 8 node air impulse massage that provides analogue pressure pointing with pulsing force. But its main selling point is Voice Response. 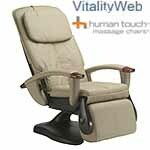 With Voice Response the HT-1650 chair will audibly affirm your selection of any of the 8 onboard massage programs. Voice Response also guides you through the Acupoint Detection process, allowing for pin point massaging of those areas of your body you want massaged. Full-Body Stretching The calf massage wells will gently hold your legs as the chair reclines to arch your back and engage a gentle body stretching program with an active massage of your lower back. Luxurious Leather. NEW Extending footrest for taller individuals. NEW Arm and Thigh massage Sleeves + Seat Massage. New Massage Comfort Number system lets you control the intensity of the massage from gentle to intense without interrupting your massage session. Also features lumbar heaters to gently warm lower back muscles, gradually reducing tightness and pain. Rotating adjustable width calf and foot massager with the new width control feature for a customized fit. Full-Body Stretching. 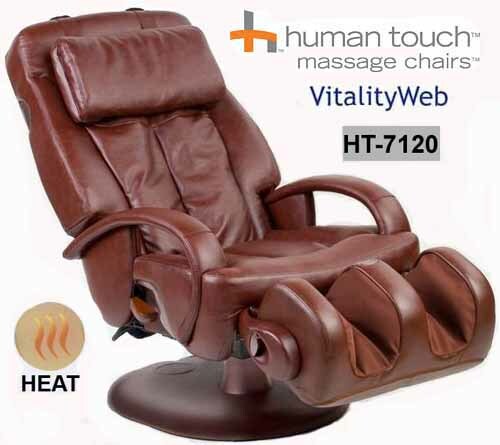 This HT7450 is a zero gravity massage chair of very contemporary design. As the HT-7450 reclines, its back, seat and footrest synchronously move to position the body in a virtually weightless condition – the ideal posture for massage. Once in position, the Human Touch robotic massager gets to work giving you a deep, invigorating massage of the neck, back and legs. Incorporating the very best materials, ingenuity and functionality we have to offer, the AcuTouch� 9500 is our premier massage chair. 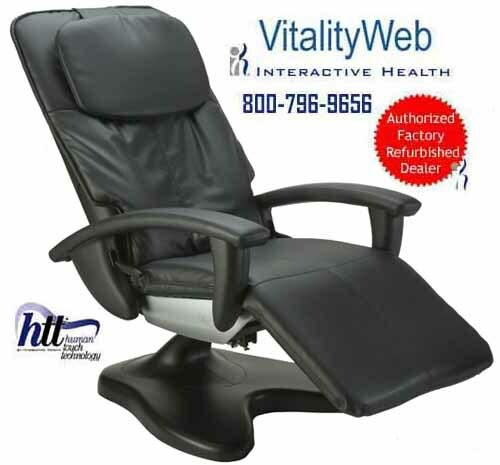 In addition to a wealth of wellness techniques, programs and features, this advanced chair features HT-Connect�. This free downloadable app for iPhone, iPod touch, and iPad provides instant access to a world of resources, massage programs and expertise designed to improve your wellness and life. Discover the evolution of wireless wellness. The AcuTouch� 9500 delivers all the massage features you've ever dreamt of � and personalized control you never could have. Please note: iTouch, iPhone and/or iPad is not included with this chair. Features Dual Lumbar Heat. 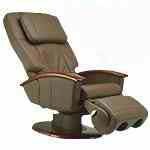 A Shiatsu massage chair is a technically advanced piece of machinery. In order to give an individual a proper Shiatsu massage, the robotic massage chair must conform to the person's body and be able to exactly locate the pressure points. If you're looking for the best shiatsu massage chair you should look for one that uses optical (infrared) sensors to find the individual's pressure points - just because the manufacturer claims its chair can give a shiatsu massage doesn't mean it actually can. Possibly the best shiatsu robotic massage chair is the Inada massage chair (though it's also one of the most expensive). A therapeutic robotic massage chair is one that relieves stress, encourages blood circulation. alleviates back pain, arthritis pain, constipation, tiredness, depression, insomnia, the list goes on. There's no such thing as the best robotic massage chair either; it's possible to find all the therapy you need with a cheap model as it is with a more expensive one. Don't be beguiled by looks. The lovely looking black leather robotic massage chair may not have the massage capabilities of another, dowdier model; always choose function over style. By all means take a look at what's out there, but it really is vital that you actually test a few models out to find the one that works best for you.